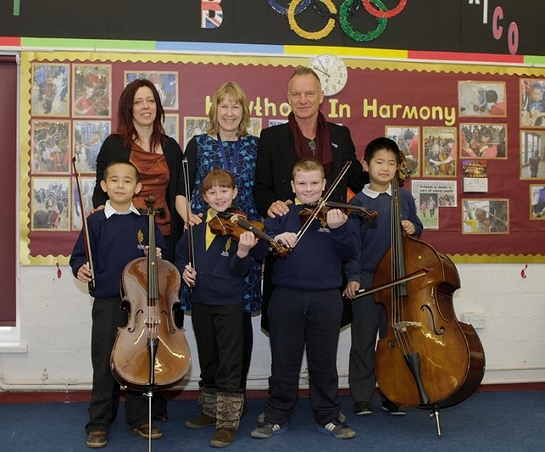 Pupils at Hawthorn Primary School in Elswick, Newcastle-upon-Tyne received a surprise visit from Sting last Friday, joining Kathryn Tickell, in support of the In Harmony Newcastle Gateshead project delivered by The Sage Gateshead. The project has enabled every child in the school access to a musical instrument and music tutors on a daily basis as part of a national programme that aims to inspire and transform the lives of children across England, using the power and disciplines of music-making. Funding for the In Harmony project came from the Department for Education and National Lottery through Arts Council England. Within this grant, money was allocated to fund a temporary basic portacabin to be built providing an extra learning room for the project. 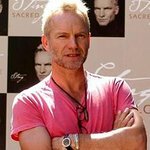 Since then, Sting, along with playwright, Lee Hall, have together made a significant further contribution to provide an even more inviting space for the young people to learn in, one of which is a permanent structure using cedar cladding that will give a lasting legacy for the pupils of Hawthorn Primary School. In Harmony is a national programme that aims to inspire and transform the lives of children through community-based orchestral music-making. It uses the principles of Venezuela’s inspirational El Sistema. Regular music lessons delivered in the school and nursery by musicians from The Sage Gateshead and the Newcastle and Northumberland Music Education Hub will help develop learning, self-confidence and self-esteem, social skills, wellbeing and health.